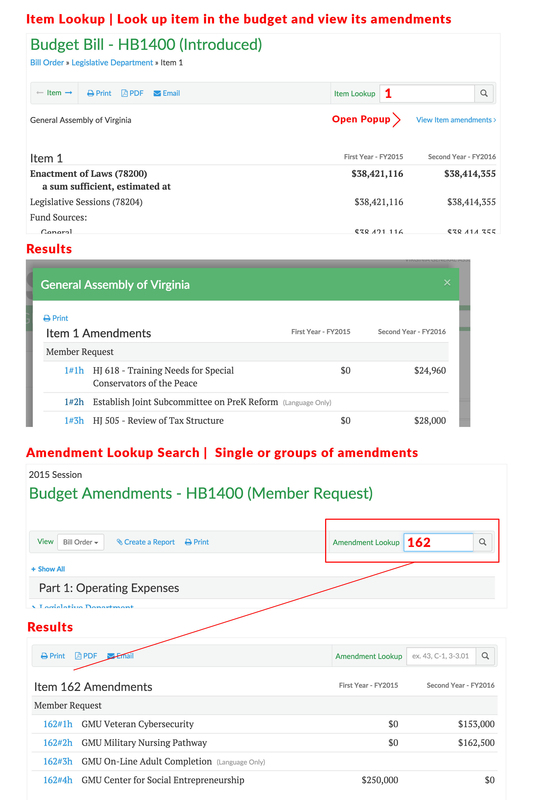 Budget Bills, Amendments, and Reports can be searched by keyword using the search box in the green bar. Change the category of documents to be searched using the drop-down at the front of the search box. By default, the category is set to the collection that you are viewing. Keyword search by collection (Budget Bill, Amendments, Reports) only searches the collection for the selected year/session. Enter a search term to see search results on the search results page. On this page, you may filter results to only show those that match a specific Bill Number, Bill Version, Amendment Stage, Part, Secretariat, or Agency. Results may be sorted by relevance or Bill order with the Sort By: drop-down menu on the search results page. By default, results display by relevance to the search criteria. Select Bill Order to sort the results in the order they appear in the budget bill. When the budget amendments page is active you can lookup a single amendment. Simply enter the item or amendment number in Lookup the box located at the top right side of the page. Item lookups will take you directly to the item, if there is a match. Amendment lookups can return several matches, if you enter just part of the amendment number. If there is a single match, you will go directly to that amendment. If there are multiple matches for your amendment lookup, select the amendment you are looking for in the lookup results list.